Protective behaviours can make a real difference in helping to keep your child safe, especially in combination with a positive parent-child relationship, good communication and appropriate supervision. Child abuse happens when a person uses their power or authority to take advantage of a child’s trust, and involve them in an activity that is harmful to them. This may be physical or emotional harm, or it may involve sexual activity. Irrespective of the type of harm, it is important that children are protected. You can help protect your child by teaching them protective behaviours, or in other words, how to keep safe. When should I start talking to my child about protective behaviours? From a young age children inevitable spend increasing periods of time outside the direct supervision of their parents – for example, at child care, at school, with extended family, friends and neighbours. As soon as children can name their body parts and begin to understand and name feelings, parents can introduce the idea of protective behaviours. At 3 years of age children are able to say NO and tell a parent if something has happened which has made them feel scared or uncomfortable. As children grow older more information can be given to them to help them keep safe. This is a process that can continue right through adolescence. Protective behaviours are ideas that parents and carers need to talk about with children over time, gradually adding more detail and discussion of this topic as children grow older. How do I talk to my child about protective behaviours? You may wish to introduce the subject by reading an appropriate picture and story with them, even at pre-school or primary school age. Day to day situations with your child also provide many opportunities for teaching new skills, such as when there is something relevant on TV or in a story, or during bath time or dressing. Discussing road and water safety can be a good starting point to talk about other types of safety, such as personal safety. There are also many general conversations in which to do this, such as when talking about body parts or sexuality issues, other adults in a supervisory role, or any problem involving new experiences or a degree of risk – for example bullying, teasing, situations that provoke anxiety or fear, or staying over at a friend’s house. What does my child need to keep safe? Talk to your child about what it means to feel safe. What does your child think of when they say the word “safe”. Ask your child what sorts of situations do they feel safe in and what sorts of situations they might feel scared in. Think back to your own childhood and give age appropriate examples to your child about situations you felt safe or unsafe. Help your child to name their feelings, e.g. when they feel happy, sad, angry. When your child has a feeling encourage them to describe what is happening to their body at that time. 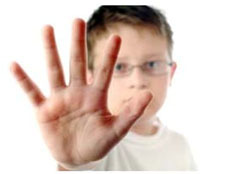 Discuss with your child what is happening to their five senses when they feel safe i.e. their sense of touch, smell, sight, taste, sound. Ask them to tell you how their body feels when they are frightened, e.g. they might feel funny in the tummy, their knees might shake, they might get a headache or start to perspire, or they might feel like running away. You can help your child to identify situations in which it is fun to feel a little scared (such as during a scary movie), or when feeling scared is uncomfortable (such as when somebody hurts or teases them), and situations where they feel safe and comfortable (such as when they are signing songs or watching a funny TV show). This process helps children to identify their feelings. It is important that children are encouraged to express their feelings, even those feelings which may make others feel uncomfortable. A child who is always told to “shut-up and stop crying” learns that their feelings do not matter. A child who has the confidence and opportunity to express their feelings is in a much better position to keep themselves safe. You can help your child to express their feelings by listening to them, accepting and understanding their feelings, and by being someone who shares their own feelings. Encourage them to say NO when situations make them feel uncomfortable or unsafe. It may not always be possible for a child to say No because of fear or threat of violence. When teaching children to say no, let them know that they must seek help later by telling a responsible adult. Talk to children about the names of their body parts, including private parts. Tell them the proper names as well as the more commonly used terms. Bath time is a good opportunity to do this, and to explain that their bodies are their own and nobody should touch them in a way that makes them feel confused or uncomfortable. Let children know that it is not OK for others to touch their private parts, unless someone is helping them with toileting or at the doctors. Introduce ideas about good and bad touches by talking about how nice a hug or kiss can be. Explain that people often show they care about or love someone by touching them. Children often touch pets to show them how they feel. Talking about pets can be useful example to use to talk about the likes and dislikes a pet might have when they are touched in different ways. You can also ask your child about the kinds of touches they like and dislike , e.g. being tickled. When talking to young children about tickling, help them to understand that something might be fun at first, but they are right to say NO when it is not fun for them anymore. 6. Sometimes adults do things that are not OK.. Explain to children that sometimes even people who are good do things that are not OK.
People who abuse children often depend upon the child to keep secrets. It is important to teach children to say No to this request. In some families, children are taught to keep surprises but not to keep secrets. A surprise is information that will eventually be shared, such as a present or party. Another idea is to teach children the difference between good and bad secrets. Children should always tell a trusted adult if anyone asks them to keep a secret about things that make them feel embarrassed, or uncomfortable. Explain that sometimes people may try to trick children into doing things they don’t like, by offering presents, money, or sweets. Teach your child to say they need to ask mum or dad first, and then leave to get help. Your child should be encouraged to tell you if someone tries to trick them. Assure them that there is nothing they can’t talk about it with someone they trust, no matter how awful it seems. While parents hope that their child will talk to them if something happens, they may not always be available to help straight away. Help your child to develop a network of trusted adults whom they can talk to if they are feeling unsafe or worried by a problem. Make sure these adults are aware of their role. Explain to your child that sometimes the adult they tell may not understand or may say “Don’t be silly”. Reassure them that they should keep on telling until someone does believe them and does something to help. You and your child can practice what to do in possible risky situations, e.g. if they were locked out of home; if mum or dad were late picking them up from school; if somebody at school started to bully them; if someone approached them in the park. Make sure that your child includes a response which involves telling an adult. 11. What about overnight visits? Be sensible about knowing who is looking after your child. Meet their friend’s parents and other adults who may be in the home. Encourage children to talk about how their time was after they’ve been away from your care. Try to make sure that your child is always supervised well, as this helps to prevent unsafe situations. Encourage respect for privacy with your child’s bodies and their bedrooms. Find out if there is a Protective Behaviours Program at your child’s school. Be ready to answer any questions! Enough is Enough thanks for this article Parent Line Australia. This is cute design. I like this very much.